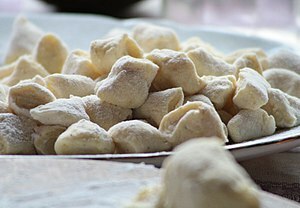 Makin’ Gnocchi – Great Way To Keep The Kids Busy! December 21, 2013 by midgeguerrera, posted in Food - Eating In and Out! What’s a woman to do when the farmer down the road keeps dropping off pumpkins? I know what your thinking – It’s December and Thanksgiving is long over. Why the devil are you getting pumpkins? I made the mistake of mentioning that I put left over Thanksgiving pumpkins to use by baking them, cleaning and gutting them and freezing the pumpkin to make soup, pie, pumpkin gnocchi etc. 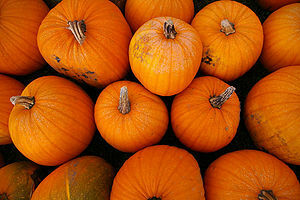 In the friendly world of farm country that means – hey, the chick down the street will take all your left over pumpkins! As my friend Jonathan said to me, “when life gives you a shitload of lemons – make lemonade.” Well, the pumpkins were multiplying and I decided to make pumpkin gnocchi! Christmas is right around the corner so why not be a little daring – make pumpkin gnocchi for your primo piatto. No one will expect it. I must tell you – after the grandkiddies go gaga from staring at electronic toys you can save the day by playing makin’ gnocchi – otherwise known as rolling and slicing snakes! Jack, a member of my extended family, came over one day and it was too cold to play outside. What saved the day? Makin’ gnocchi! His mom was our videographer – enjoy! Cooked up a pumpkin. Got rid of the seeds. Sliced it and mashed up about a 1/2 cup. Peeled and cooked potatoes and mashed up about 1 cup. Mixed the potatoes and pumpkins together really well and tossed in 1/4 cup grated Parmesan Cheese, a dash of cinnamon and nutmeg. Then we added about 1 1/2 cups of flour – enough flour to make it look like a dough. We took handfuls of dough and made snakes. Cut the snakes into 1 inch pieces and put them on a linen towel to dry. You can score them with the tine of a fork if you want to be cutesy. A big pot of salted water was put on the stove. When it was boiling I dumped in the gnocchi. They sunk. When they floated to the top they were done. How simple is this! The sauce was just melted butter, sage and chopped pumpkin – with the necessary salt, pepper and more grated parm! Enjoy the kids – play Makin’ Gnocchi!